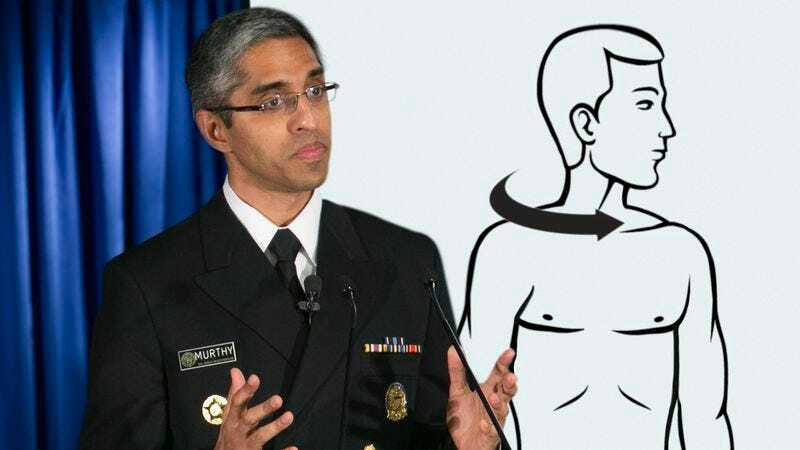 WASHINGTON—Describing the act as small but incredibly satisfying, U.S. surgeon general Vivek Murthy urged all Americans Thursday to twist their head far enough until they hear a little pop. “We strongly advise everyone to pivot their head in one direction and just keep going until you hear a good crack,” said Murthy at a press conference, adding that citizens should not just stop there but to make sure to do the other side as well. “It might take a few tries, but you’ll definitely feel a solid pop when it happens. You can put your palm on the bottom of your chin in case you need a little extra push. We also recommend rolling your head around a bit afterward—get it nice and loose.” Murthy later advised Americans, once they’ve twisted their head, to crack all their knuckles one by one.